Cigarette smoke is well established as a human carcinogen. It produces very high levels of VOCs, including as many as 3,200 gases and 4,700 chemicals. The chemical composition of environmental tobacco smoke (ETS) is qualitatively similar to mainstream smoke and side stream smoke and it also acts as a carcinogen. Nonsmokers in smoking environments experience exposure to ETS large enough to increase their risk of lung cancer and other respiratory diseases. Epidemiologic studies have demonstrated an increased lung cancer risk with “involuntary” smoking. In examining a low-dose exposure to a known carcinogen, it is rare to have such an abundance of evidence on which to make a judgment, and given this abundance of evidence, a clear judgment may now be made: exposure to ETS is a cause of lung cancer. The goal is to reduce the levels of VOCs being released through a natural oxidation process, reducing the exposure of casino guests and employees to dangerous chemicals and also eliminating the related odors of cigarette smoke. This provides a much cleaner, more enjoyable and safer environment for all concerned. Evaluate the effectiveness of the Casino Air system at reducing VOCs associated with tobacco smoke. Upon initial construction, Harrah’s purchased a BioClimatic smoke removal system. Site staff and management were extremely dissatisfied with the performance of the system at removal of tobacco odors and VOCs. This test was performed to demonstrate the VOC reduction capabilities of the Casino Air Molecular Oxidizers. EcoSensor VOC Sensor Model C-20, solid state gas monitor designed for sensing general magnitudes of volatile organic compounds (VOCs) Sensor type: Heated semiconductor Sensitivity: .001 — .9 parts per million Onset: Tattle Tale Model 8; multichannel data logger controlled by Motorola 68332 and PIC 16C64 processors. Eight, 12-bit analog inputs, 14 TPU channels, and two RS232 ports. 100 Khz sampling rate using C,2 Khz sampling with Tx basic. 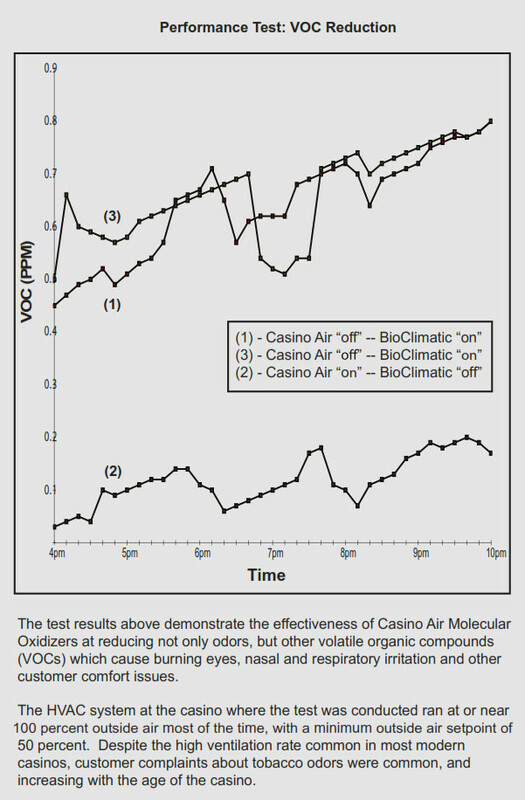 Test results emphasized the effectiveness of the Casino Air system at reducing VOCs. Results from Samples 1 and 3, with Casino Air turned “off,” indicate an average ambient VOC level of 0.66 ppm. With the Casino Air system “on” (Sample 2), the average ambient VOC level was 0.13 ppm. These results confirm that VOCs were reduced in the Harrah’s Mardi Gras property by more than 80 percent by the Casino Air system.